Century after century, home along the east-central coast of the Arabian Peninsula generally meant a house of mud or coral brick, roofed with palm thatch, in a small town or settlement. Food staples were local dates and rice, as well as fish that came to shore aboard dhows powered by the winds. Cooking was fueled by wood, carried to the coast by camel from interior oases. It was an economy powered, directly and indirectly, by the sun. Though by today’s standards it seems little more than sustenance, it endured. It was sustainable. This all changed in the last century, of course, and in 2007 global population tipped its balance, for the first time, from rural to urban. More than ever, ours is a century of cities. What kinds of cities will these be, five, 20, 100 years from now? From those carrying millennia of history to those built entirely anew, we face pressing questions about not just where we live and how we get around, but also how much energy we use. “Carbon footprint” has become fundamental for thinking about cities. This has set before urban planners a challenge: How can we extend the lifestyle benefits of cities while minimizing their carbon costs? While many cities are experimenting with adaptations, the greatest prize is a city that is fully “carbon neutral” or “zero carbon.” Is such a city possible? If we tried to build one, what might we learn? Ten years ago, a few kilometers east of Abu Dhabi, the capital of the United Arab Emirates, the first attempt broke ground. 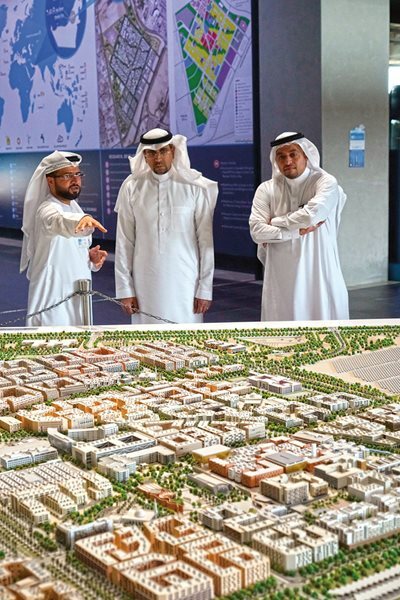 A hybrid of some of the region’s oldest, most sustainable urban ideas and new, high-tech ones, it was named “Source” in Arabic: Masdar. Left: A 45-meter high harvester of the wind, Masdar City’s tallest structure is a modern version of the region’s traditional barjeel, or wind tower. Using a TeflonTM-coated tube, it channels breezes to ground level. 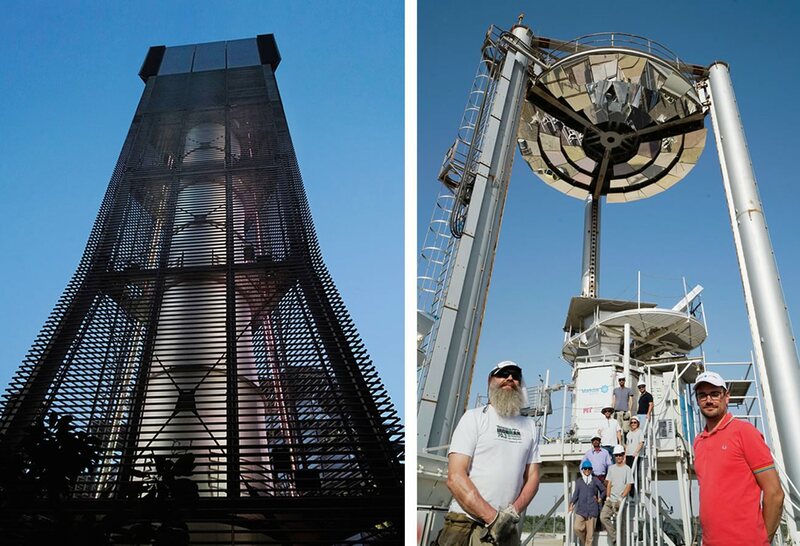 Right: Professor Alexander Slocum and Solar Platform Chair Nicolas Calvet flank their research colleagues at Masdar’s prototype solar Beam Down Tower. It uses focused sunlight from 33 mirrors to melt a thermal energy storage reservoir of four tons of salt, which can be used to drive steam turbines both during the day and at night. 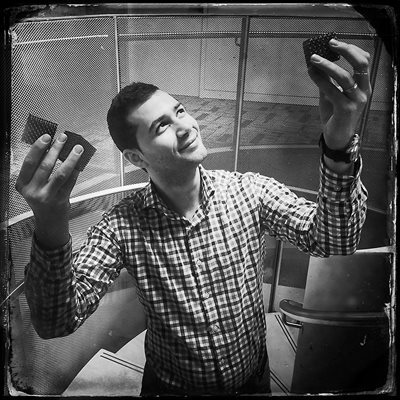 Above: Flap-like squares vent heat from an atrium in the three-year-old Siemens building. According to the company, in its first year it used 63 percent less energy than a typical office building in Abu Dhabi. 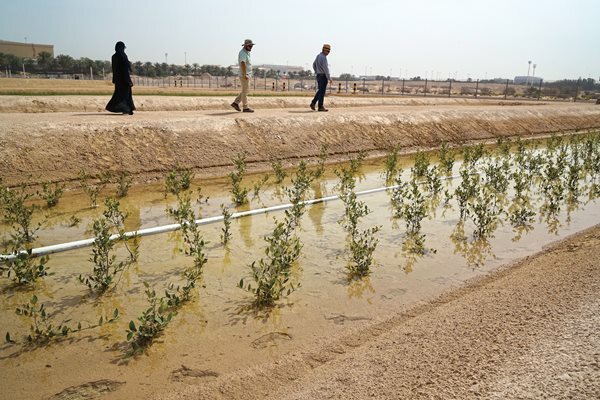 Below: In Masdar’s experimental Seawater Energy and Agriculture System, young mangroves help clean wastewater that begins as effluent from fish and shrimp aquaculture ponds that passes first through a field of salt-water-tolerant Salicornia. At the end of the mangrove wetland, the water is returned to the sea; the Salicornia oilseeds are harvested to produce aviation biofuel. 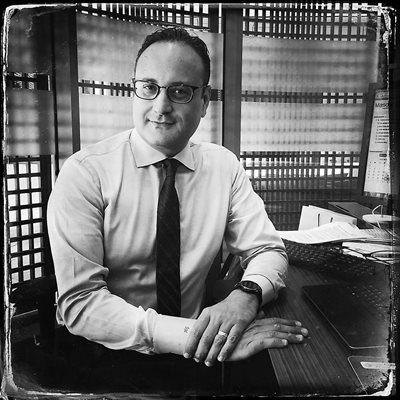 “Our aim for Masdar City is to realize a template, a ‘greenprint,’ for sustainable urban development,” explains Yousef Baselaib, Masdar’s executive director of Sustainable Real Estate. It began as a blank slate, just six square kilometers of open desert, with seed capital from the government of Abu Dhabi. It faltered after the 2008 financial crisis, and several early design elements proved too costly, but its planners persist and adapt. The result is arguably the world’s largest urban sustainability project, and the lessons from it stand to inform city-making in the region and worldwide. British “starchitect” Lord Norman Foster, long renowned for iconic buildings that are both visually memorable and environmentally sensitive, such as London’s jewel-like Swiss Re building and Berlin’s glassy restoration of the Reichstag, received the first commission from the Abu Dhabi government’s newly established Masdar Company. 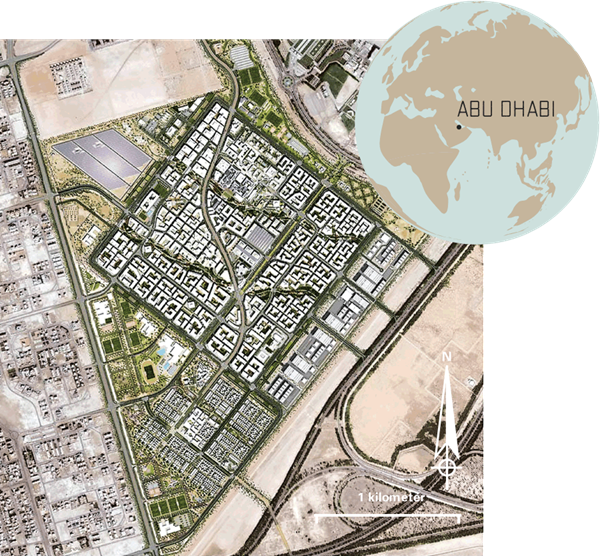 Oriented to catch cooler winds from the desert and warmer ones from the water, Masdar’s square plan—shown above as a projection of the planned city—includes home and commercial sectors, with shaded pedestrian corridors and metro and light-rail lines. What happens within the buildings became just one piece of a puzzle. The streets between the buildings, and how these interact with the buildings, were all now of concern. The planners had to find the balance to achieve environmental sustainability for everything. The first challenge was the oldest: How to stretch, through the seasons, the number of comfortable—or at least tolerable—days without recourse to air conditioning? They began by looking at other old cities. From Fez to Cairo, Jiddah, Muscat, Shibam and even Venice, they saw how labyrinthine streets give a daily mix of light and shade. They looked at the relationships among living areas, markets, mosques and plazas to see how people have used urban space. In Cairo, especially, they noted how narrow streets were often made short, blocked by buildings, so that warm air pouring into them is pushed up, flushing out heat. They saw this effect at work also in Yemen, in the mud-tower city of Shibam, where air becomes more turbulent amid the complex arrangement of buildings and streets, making the city a refuge from desert heat. To harness the cooling effects of breeze and shade, the team of Foster + Partners planners combined on-site wind and temperature studies with computer modeling of wind and sun. They found they could best harness the effects of breeze and shade by orienting the entire squarish city along a northeast-to-southwest axis. Using the principle that at night land loses heat faster than water, this would, they reasoned, gather cooler winds coming off the desert more than the warmer breezes off the water. Then, in their boldest move, they raised the city onto a seven-meter platform, which split it into two levels. On top would be a shady, breezy, quiet, pedestrian-only zone, and all transportation would take place on the lower level. There, it would rely on a system of autonomous “Personal Rapid Transit” (prt) vehicles—driverless, six-passenger pod cars running on magnetic traction. These would zip around beneath the city and be easily accessible to everyone. As about 25 percent of any city’s carbon emissions come from transport, this network alone took Masdar City a long way toward a carbon-neutral goal. “In the context of 10 years ago, we were way ahead in thinking about the future of mobility,” says Evenden. “We thought the vehicles couldn’t be efficiently coordinated with people walking in the streets, so we separated them.” Now, he acknowledges, emerging autonomous vehicle technology may make this concern moot, allowing autonomous vehicles to move safely in the unpredictable bustle of ordinary city streets. Only one prt route was built, and although it’s working, it’s largely a tourist novelty now. Taking inspiration from traditionally dense Arab world cities, buildings in Masdar are close together to provide shade and channel breezes. Visitors to Masdar Institute view a model of the city as currently planned for 50,000 residents and 40,000 commuting workers. 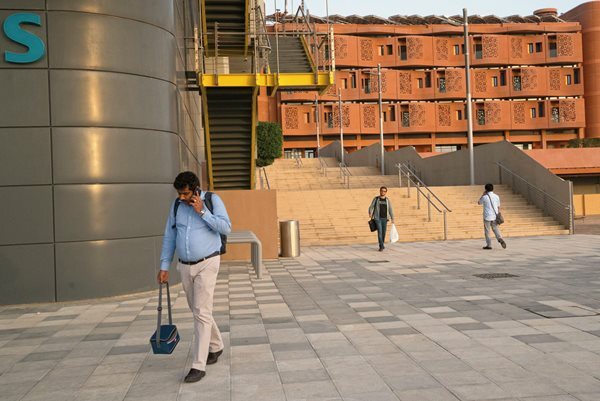 Masdar City is one of many attempts around the world to contribute to knowledge of sustainable city-making. A few have made notable strides toward reducing carbon emissions, conserving water and reducing waste. Stockholm’s ability, built up over decades, to capture its waste and turn it into energy is exemplary. Dutch cities have long used careful planning to allow the most densely populated country in Europe to maximize preservation of farmlands. Copenhagen’s EnergyLab Nordhavn focuses on managing complex, decentralized energy flows, and its emphasis on heating rather than cooling makes it a kind of northern counterpart to Masdar. 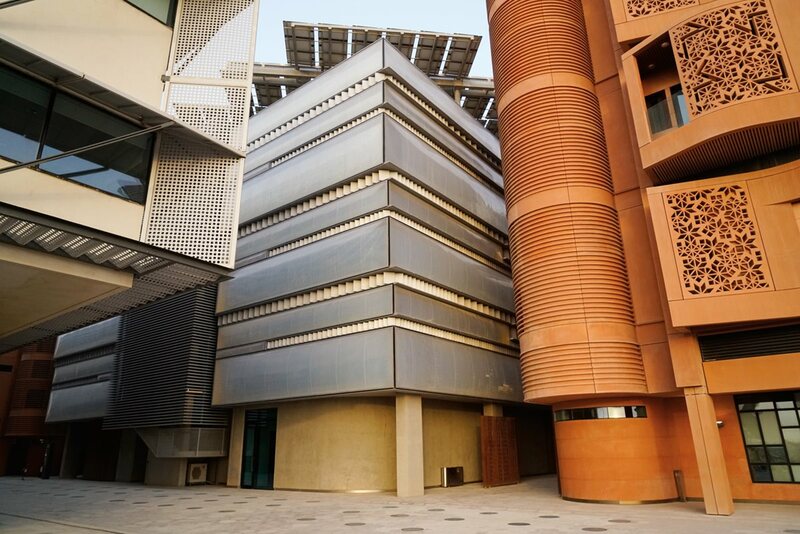 Foster + Partners also built a home for Masdar Institute, which opened in 2010 in Masdar City. 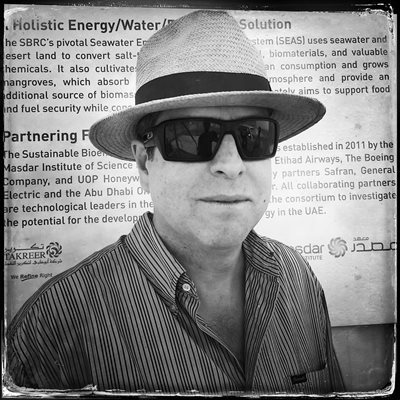 Now, nearly 1,000 post-graduate researchers and instructors are looking into dozens of aspects of sustainable-energy research, some focused specifically on Masdar and others on broader issues. The institute rises from the concrete platform near the center of the development site, and around it residences and labs are arranged precisely, separated by narrow sikkak (passages) and courtyards that make the most of—and even amplify—breezes and shading. With its height above the ground making air movement slightly faster, the house produces temperature measurements that, compared to central Abu Dhabi, show what architects call “felt heat” can be cooler by as much as 10 degrees Centigrade. 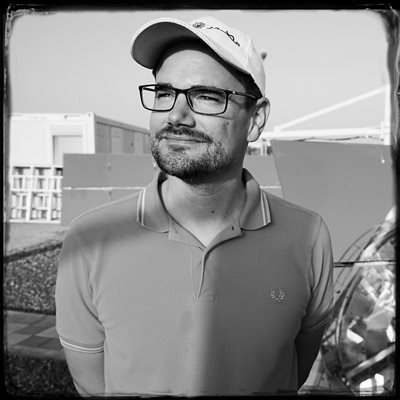 “It’s telling the wind what to do,” says Senior Design Manager Chris Wan, who describes how Masdar extends the “crossover line” for comfort by as much as a month at each end of Abu Dhabi’s summer. 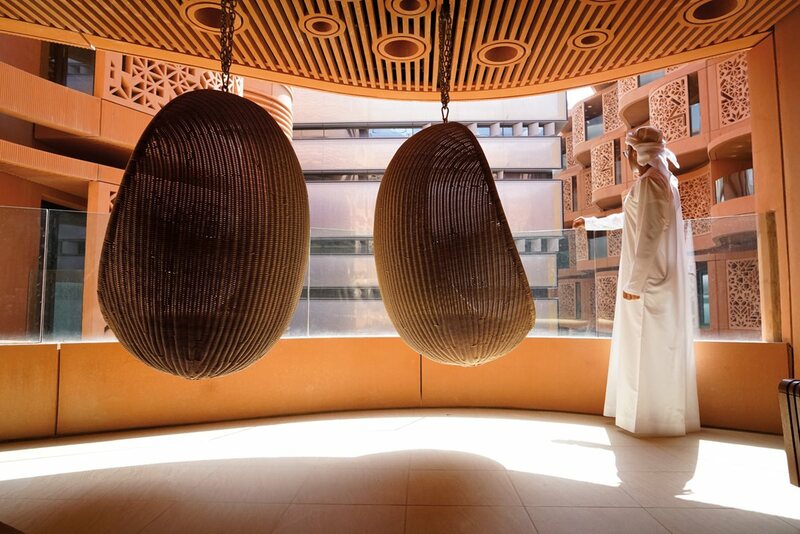 A Hong Kong native who has been with Masdar since 2008, Wan describes how the designers blended high technology with passive design to coax nature’s forces to act benevolently. Energy demand from the buildings is 40 to 50 percent lower than typical for the area, he explains, “including a/c, lighting, everything.” Wan also points out how the buildings’ unique facades contribute to these gains: The red-hued student residences, for example, have wavy walls of glass-reinforced concrete that moves breezes. Windows have narrow slats on the outside that are modern reinterpretations of the traditional Arab mashrabiyya or lattice window screens, which prevent sunlight from touching the glass. Lab building walls use layering to defend against heat, with outer plastic sheets into which low-pressure air is injected atop insulating fabric and aluminum panels. 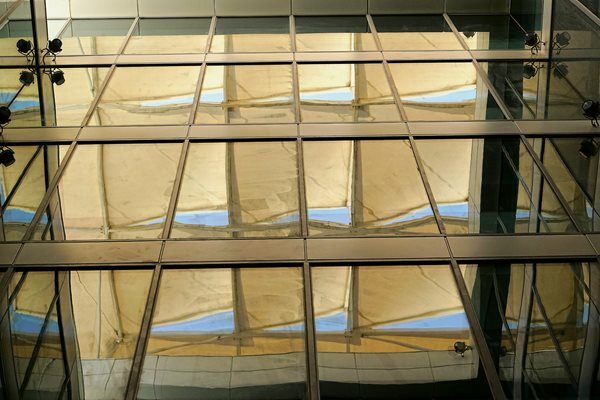 Between Masdar Institute and the Siemens building, narrow sikkak draw breezes through a shaded courtyard. At its center, Masdar’s tallest structure, a prototype barjeel, or wind tower, reaches 45 meters high, well above the surrounding buildings, to where its wind scoop can harvest breezes. This iconic piece, visible from afar, is perhaps Masdar’s most eloquent synthesis of traditional and high-tech passive design. Based on the mud brick barjeel of the region’s traditional houses, it captures and channels winds down into the courtyard, cooling the air along the way. 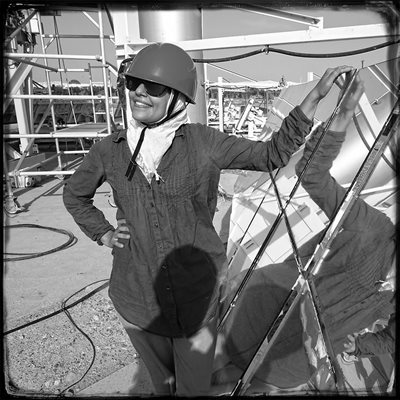 Made of a huge Teflon tube in a metal frame, it links to a roof-mounted weather station that sends atmospheric data to a computer whose algorithms are taken from research on human comfort levels in this region. The computer controls the tower’s wind capture and even the injection of mist for evaporative cooling of the breeze. Then there is solar power. Above the courtyards, edges of south-oriented rooftop photovoltaic solar arrays project sawtooth silhouettes. These provide about 30 percent of the buildings’ energy needs. The remainder comes from Abu Dhabi’s electrical grid, but what Masdar uses, it more than replaces. 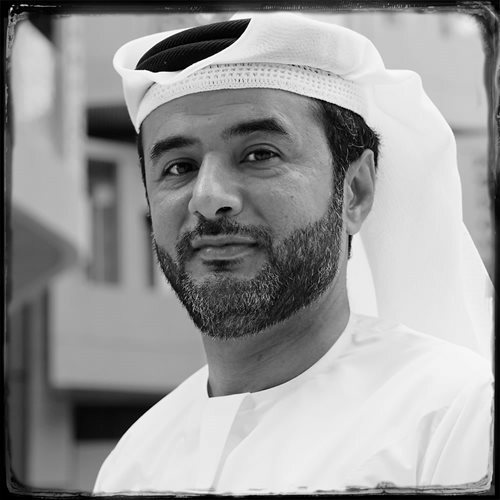 Its 10-megawatt solar plant along Masdar’s northwest edge and the Masdar Company’s new 100-megawatt Shams 1 solar power station, located in the desert 120 kilometers away, together send enough power to Abu Dhabi to power Masdar City six times over. To date, only the first of Masdar’s five planned phases stands built. Siemens, irena and a few other companies are showing Masdar’s potential to become an incubator of new energy businesses, which the government is also encouraging through its designation of Masdar as a tax-free zone for foreign businesses. Evenden says that when Foster + Partners finished its work in 2012, Masdar City was carbon neutral. The firm also tried to be as carbon neutral as possible during construction, by sourcing materials and recycling construction waste, although it could not displace the energy requirements of conventional construction machinery. 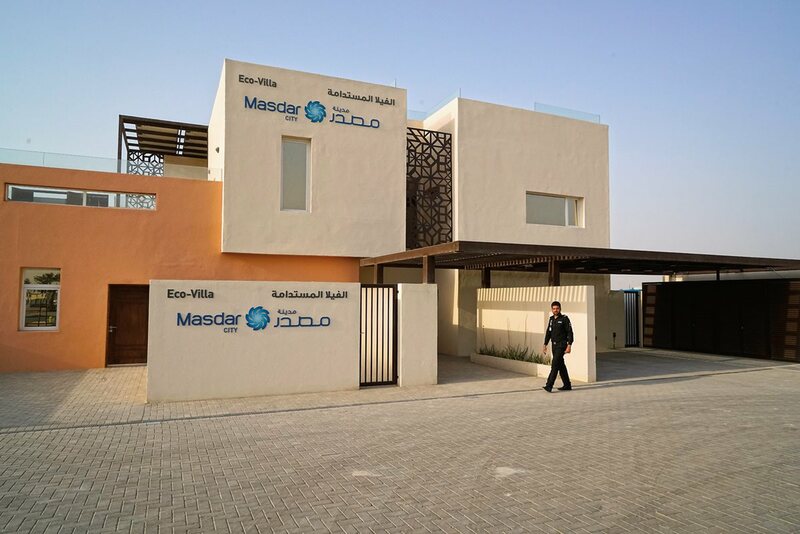 Masdar City’s prototype two-story, four-bedroom Eco-Villa consumes just 25 percent of the energy of a comparable, typical Abu Dhabi home at equivalent construction costs. Equipped with 87 rooftop solar panels, it is intended to be a net contributor to Abu Dhabi’s electrical grid. In use since 1984, Leadership in Energy and Environmental Design (leed) is a three-tier certification system—Silver, Gold and Platinum—developed by the us Green Building Council. Leed certification may apply to commercial buildings, homes and neighborhoods. The system awards points in many areas of energy performance and construction techniques. The tier awarded indicates the extent to which a building or neighborhood meets efficiency and offset standards. Established in 2007 and managed by the Abu Dhabi Urban Planning Council, Estidama takes its name from the Arabic word for “sustainability.” While similar to leed, it is specific to the cultural and climatic conditions of the Arabian Peninsula. Its rating system awards from one to five “pearls,” with five pearls being the highest. Masdar City is targeting a four-pearl Estidama Community Rating, which would be the highest ever given to date for a community. 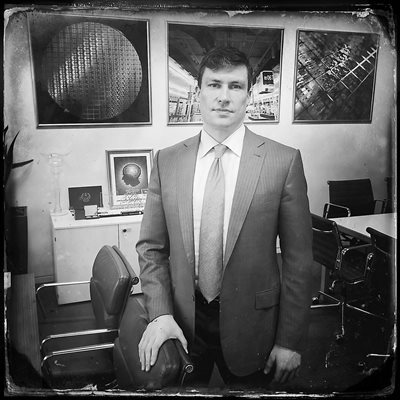 This, he maintains, has opened the door to other developers and exposed the project more to market forces. This aligns it better with the reality of city building. 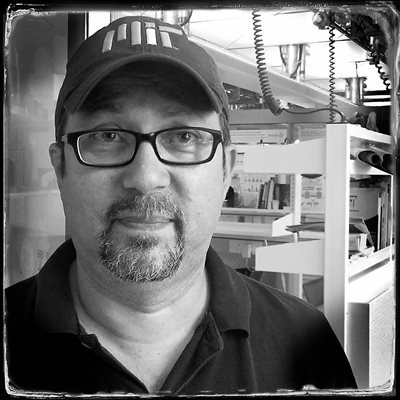 “We’ve come from ‘we’ll do everything and we’ll build a product’ to the idea that cities are how the world builds things. They are a process,” says Mallows. This new openness has at least partly revived Masdar City’s fortunes. Phase 1 of nearly 1 million square meters is now complete or under construction. New apartments are rising around the institute. Detailed master planning is now finished for Phase 2, which will rely on bids from outside developers. The goal is to build about 1 million square meters every five years, based on market demand, through 2030. Engineering research assistant Abdulrahman Alzaabi’s apartment is shaped by the wavy walls that help move breezes outside. 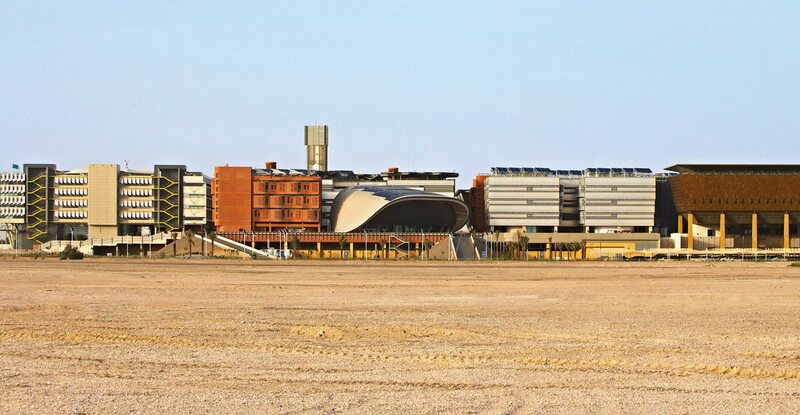 The current population of Masdar City is made up of students and faculty at Masdar Institute and employees of companies including Siemens, General Electric, Mitsubishi and the International Renewable Energy Agency. Now, the most pressing task for Baselaib’s team of planners is to fill the city’s empty quadrants with homes, workplaces and schools for the 50,000 residents who are expected to live here, as well as the 40,000 commuters. 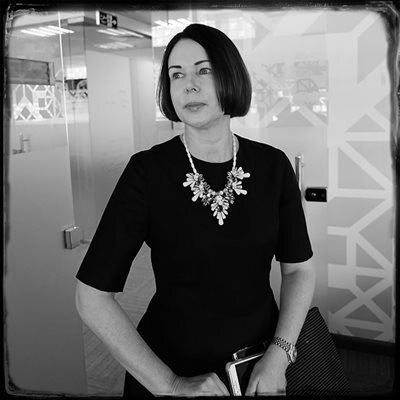 “Norman Foster’s plan began with a powerful vision, and the vision for Masdar City remains as it always was,” says Kathy Cusack, who, as head of city design and approvals, helps coordinate the development phases in the several parts of Masdar. “The way of delivering has been changing,” she adds. Visiting students get ready for a ride on the Personal Rapid Transit (prt), which still operates on the lower deck of the first sector of the city. Although city-wide prt plans were suspended to control costs, light-rail and metro lines are under construction. Now, she explains, the city is set out in quadrants, each with major and minor streets and neighborhoods. “It gives clarity for potential investors and residents who want to see where things are, where their kids’ school will be,” she says. Key to a city both livable and sustainable is an interregional transit system, and Abu Dhabi’s planned metro will run through Masdar, linking it to central Abu Dhabi and the nearby airport sometime after 2020. She says a light-rail tram is also foreseen, as is a “‘circulator’ of some kind” to serve the residential quadrants—all to try to minimize automobile reliance. 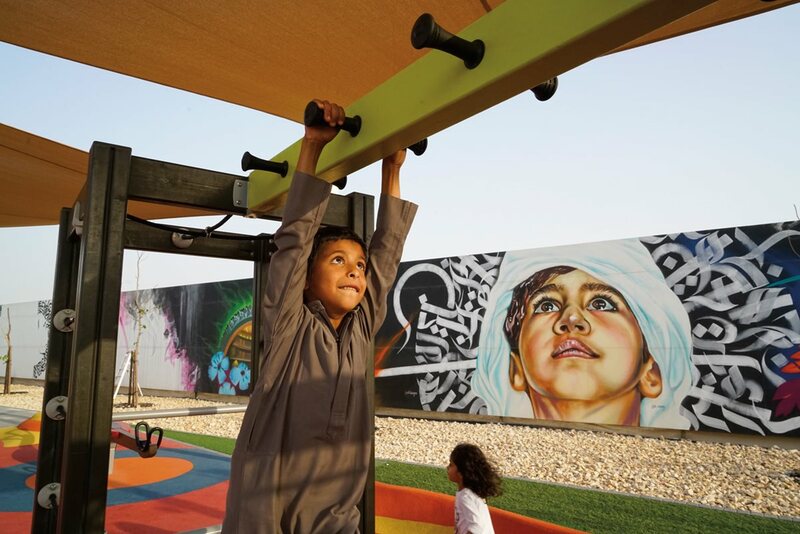 Above: Masdar’s first park includes not only play equipment but also an audience-powered outdoor cinema: About a dozen of its viewing seats are also stationary bicycles. 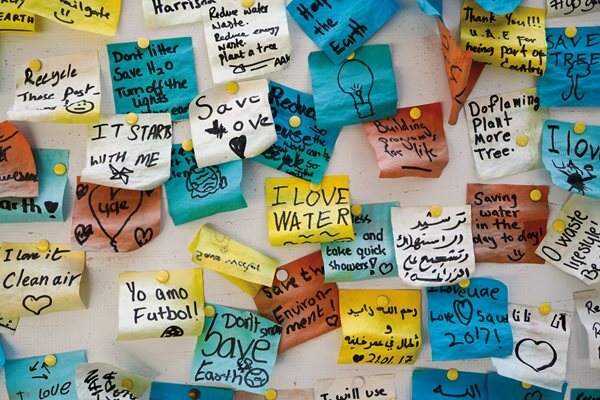 Messages to Masdar, below right, cover a wall panel following public programs during January’s Abu Dhabi Sustain-ability Week. 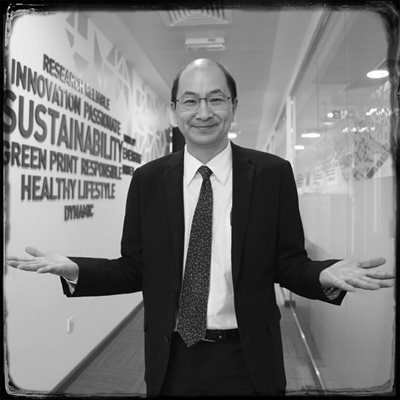 The planners believe that with Phase 2’s implementation, they will make further gains toward the low-carbon goal. Under construction is the prototype two-story Eco-Villa, a comfortable home equipped with solar panels that consumes just 25 percent of the energy of a typical Abu Dhabi house. The goal is to achieve net-zero energy consumption. Success, Cusack points out, could mean a new paradigm for housing in the region. There are two major ways a city moves toward net zero carbon: Reductions and Offsets. Conservation and efficiency are hallmarks of carbon reduction, and clean-power generation that exceeds a city’s own demands—such as Masdar’s solar fields—are examples of offsets. Net results can be calculated city-wide by looking at electricity, heating and cooling, transportation, industries, construction and any other factors that affect energy use and production. A zero-carbon city is one that replaces the carbon-based resources that it uses. Cusack explains that the new master plans are, perhaps not unexpectedly, increasingly detailed in their blendings of passive design and high tech to achieve energy savings at high comfort levels. With these tools in place, she can work with developers on the details of community design in the clusters and small squares connected by a combination of narrow sikkak, open spaces and roads. As Abu Dhabi itself fills in the desert around Masdar with its own relentless, more conventional growth, the question remains to what extent will Masdar realize its zero-carbon dream? And of even more interest to the world, to what extent will its greenprint fulfill its own Arabic name to become a source of knowledge for city builders everywhere? With its wind tower playing an iconic role not unlike a central skyscraper in a more conventional city, Masdar City limits its building height to five stories to maximize energy efficiency. The original platform separating the transportation-oriented lower level can be seen below the buildings, center. The master plan calls for a green corridor, now under construction, along this strip of sand.